Each summer, a diverse group of youth experience hard, meaningful work on our farm and in the community. The deadline for 2018 applications has passed. Applications for the 2019 SYP will open in late February. work on our farm and in the community. The deadline for 2018 applications has passed. Applications for the 2019 SYP will open inmate February. social change through hard, meaningful work. Our vision is to create personal and social change through hard, meaningful work. What does the Summer Youth Program (SYP) do? 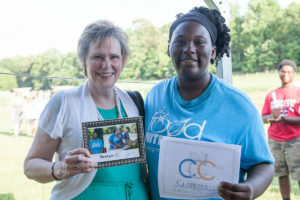 The Food Initiative’s SYP connects high school students in grades 9th-11th from all over Clarksville/ Montgomery County and Fort Campbell. The youth work hard in our sustainable garden and the community at hunger relief organizations for four weeks over the summer. Each youth is sponsored by a business or willing so he or she may receive a stipend for their hard work. Diversity is critical to the unique culture we’re seeking to create. We can see that racism and inequity persist in our society, and we believe that when people from diverse backgrounds learn to work together and engage in cross-cultural learning, they break down isolation, fear, and hatred. A nation with such diversity needs leaders and citizens who can thrive within a multicultural society and world. For this very reason, we carefully select teenagers from a variety of economic, ethnic, religious, and social backgrounds to participate in our programs. We choose not to isolate one at-risk group to the exclusion of another. We want teenagers from all walks of life to work together, to learn from one another, and to create a safe and productive environment where people of all backgrounds feel invited and empowered to contribute fully. What does it mean to work for TFI? High school students hired by TFI, should expect to participate 100% during the Summer Youth Program (SYP). A work week is Monday-Friday with at least one field trip on a Saturday morning (you will know this date before you are hired). Each SYP session will last for 4 weeks. The dates of each session (June or July) will be listed on the application when you apply. TFI provides transportation to and from the farm each day. No students are allowed to drive themselves. We will also provide TFI t-shirts, a notebook, pen, and water bottle for each crew member. Thanks to our sponsors, each student will receive a stipend for their hard work each week. If you have any questions about The Summer Youth Program you can email Regina Hampton at regina@thefoodinitiative.org. That’s it! We are looking to hire a diverse group of students from all over the community. We keep our expectations high so that our youth can step into a culture that both demands their best efforts and engages them through service-learning experiences. The Food Initiative is not just about growing food. We’re equipping our youth with critical life skills that will accompany them the rest of their lives. In many ways, health is the over-arching theme of all that we do. We engage our youth in workshops that specifically address the systemic health issues related to diet and exercise. We also focus on short and long-term wellness goals, resiliency, health transformation, and health responsibility. By asking our youth to shoulder higher and higher levels of responsibility, our interns quickly develop the perspective and insight needed to solve problems and to bring the garden and its various operations to success. Our youth are responsible for growing and serving the food, for leading volunteer groups, for developing shared standards, for holding each other accountable, and for taking ownership of their successes as well as their failures, both individually and as a team. Community is a theme that runs throughout everything we do in the SYP. It starts with a selection of participants from all over this community. 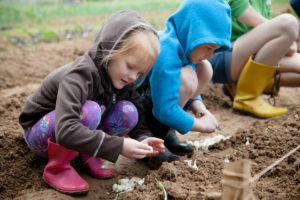 During the program, this group of strangers builds community through shared goals, hard work on the farm, serving the community, team challenges, as well as interactive games and workshops. We seek to create opportunities for relationships to be built and to sharpen communication and team skills that will strengthen and create new community. Besides working on The Food Initiative farm, crew workers also spend some time helping in the community on a weekly basis. For many of the students this opportunity opens their eyes to new volunteer sources, learning something new about their community, or learning something about themselves they didn’t know. Each youth is able to participate in The Food Initiative’s SYP because of businesses and organizations who financially back the work of the student through a sponsorship. 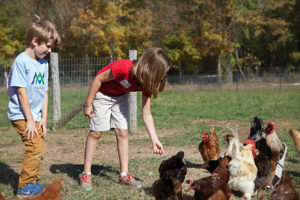 The Food Initiative offers fun and educational field trips for preschool, elementary and middle school aged kids during the school year. From corporate groups, to sports teams, to youth groups, our Cultivating Community Program offers a variety of activities that help and develop positive team dynamics.